In you guys' experience, are these 2 bullets interchangeable? I bought 1k of the Noslers years ago because they were priced right, and I am coming down to my last few hundred. Never got them to shoot very well in my ARs (yes they are 7 twist), and I was wondering if I would be better served getting SMKs next time, or am I to expect the same result. I have used both. Nosler seems to be hit or miss. I've had good results with the 69cc & 80cc's but the 77cc, while under MOA, were never what I'd call great. I lucked into a powdervalley special a while back and bought 2.5k of 77smk's when blackhills had sold off their stash and they group significantly better. 77cc shoot lights out with H4895 and 8208XBR with my same 77smk powder charge. Seating depth is different. I been shooting these in various 1:7 and 1:8 AR's with WOA, Rainier Ultramatch, Bartlein and Kreiger barrels. I'll post up my load development targets when I get a chance. How much variance are you using in seating depth with your ARs? Mijp5, Are you shooting blems? A bought a bunch of 'cosmetic blems' a few years ago and they would not shoot as well as SMK. I don't think they are blems. Came in the 1k pack, not labeled as blems. It may just be a combination of things, mainly me being a mental midget with the AR15. I load absolutely lights out for bolt action, but was never able to truly find anything close to lights out with 223 AR. 69s shoot so so, but the 77s have been just junk for me. Mine came in 100 rd plastic and were marked either blem or cosmetic blem. And as mtncreek said, the blems come in little generic looking 100 count plastic baggies, no box. I found H4895 likes longer barrels for speed. It is way faster than Varget and 8208 in my 26" 223 bolt guns but slower than 8208 or Varget in my 20" or shorter AR15's. Tried the H4895 with the 77s today and they shot lights out with 3 charges. @padom my apologies for the necro post. 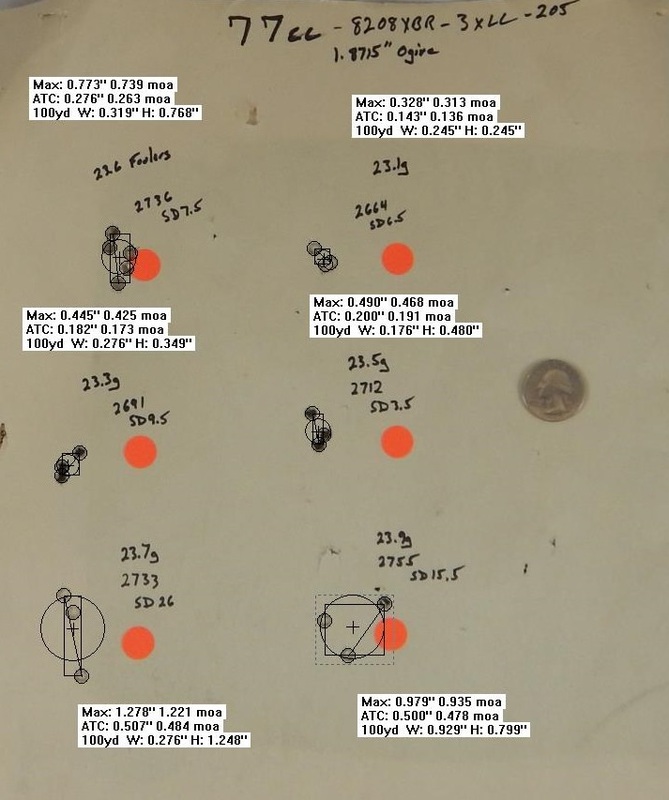 I'm interested in what your load development and seating depth tests showed for Nos 77gr CC. Unfortunately your images are not showing up for me. My OCW in my 18" WOA SPR show a nice node for XBR8208 at 23.6gr for 77gr CC, and 23.1gr for 77gr SMK, both in LC Brass. You've indicated that you found a different optimum depth than the SMK. 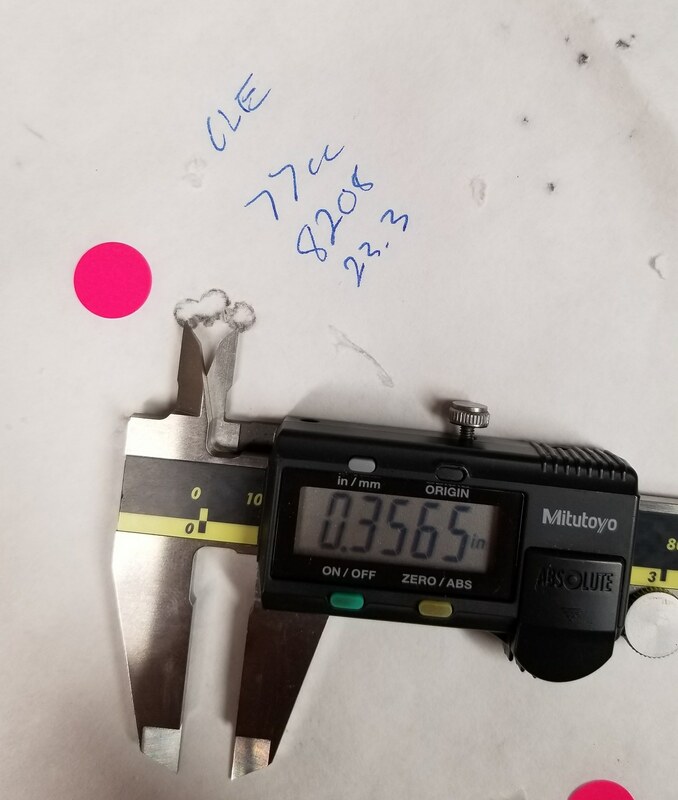 Was it shorter or longer than OAL= 2.248-2.250in? Thanks. I legged out with 23.2 XBR and Nosler 77s. I buy them several thousand at the time. I love that bullet. If you’re looking for new 77g bullets, the 77 TMK beats both. I found 1k of Nosler CC on the shelf I forgot I had so I'm good for now, thanks. 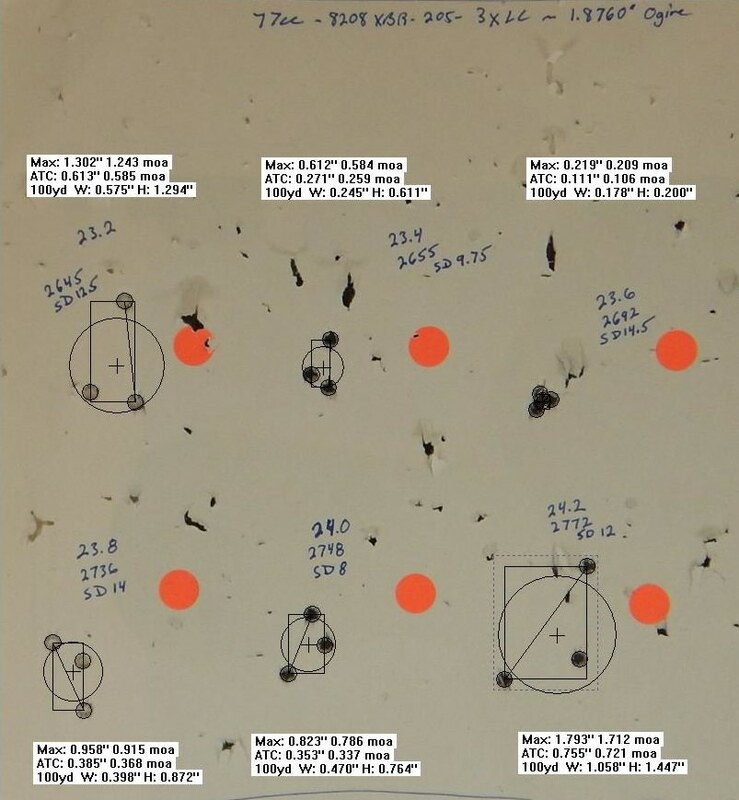 I've shot 2K Nosler 77 CC's in the past year, through a 8 twist bartlein standard .223 atop varget, and in a 8 twist Benchmark in a .223 AI atop of 8208 XBR. Both shoot lights out, so I've seen no need to change, but do send a 75 grain Amax downrange occasionally, and have about 1K 80 gr Amaxes I may eventually get to.